The Directors of Arrow Energy Ltd (Arrow) executes a Partnership Agreement between subsidiaries of Arrow and ERM Power (the Braemer 2 Partnership) to jointly develop the estimated $545m, 450 MW Braemer 2 Power Station and associated high pressure gas pipeline. The power station will be located approximately 40 km west of Dalby in Southern Queensland adjacent to the Braemer 1 power station which was managed by ERM Power from conception through to successful construction, operation and trading. The power station is in close proximity to Arrow’s Daandine and Stratheden gas fields. The project is scheduled for financial close in the first half of this year and the debt financing being arranged by ERM for the project is well advanced with selected lenders. The partnership agreement contains conditions precedent which require ERM to achieve the majority of the remaining components and documentation necessary for project financial close. Arrow will fund its share of the investment from existing cash resources and debt facilities currently being arranged. As an integral part of this transaction Arrow has signed a Gas Sales Agreement with the Braemar 2 Partnership to supply 11.5 PJ p.a. of gas over a 12 year period using a pricing formula that will look through to the underlying electricity revenues. This gas will be supplied from a combined development of the 100% Arrow owned Daandine and Stratheden fields which are close to the proposed power plant. The initial development of the Stratheden field has already been approved by the Arrow board and development work will start immediately. Arrow is delighted to be working with an established power developer such as ERM Power. ERM has carried a number of significant power projects to financial close over the last 4 years including Braemar 1 (450 MW), Kwinana (320 MW), Uranquinty (640 MW), and Neerabup (335 MW). ERM and Arrow are also considering further areas of future co-operation. ERM Power will continue to manage the project through construction and commissioning and has entered into a long term contract with the partnership to operate and to trade the power station’s output. Electricity generated will be traded in the National Electricity Market and offtake agreements including financial derivatives will be entered into directly with electricity retailers. Siemens Ltd is supplying the power plant and is responsible for the successful commissioning of the power station. Bilfinger-Berger will be the major contractor for the power station construction. Siteworks commenced in January and the first two gas turbo-generators are expected to be shipped from Germany at the end of March. 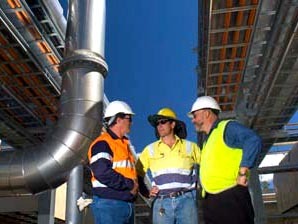 Full commercial operation from the plant is scheduled to meet peak demands in winter 2009. Arrow’s planned investment in the Braemar 2 Power Station brings the total of Arrow’s net generation capacity to 370 MW and continues its stated and well defined strategy of downstream investment to enhance margins on its gas sales. These include existing electricity sales from the Daandine Power Station, acquisition of the Enertrade assets to allow Arrow power sales through the Townsville Power Station at average field net backs of over $5/GJ, an option for a 20% interest in LNG International’s Gladstone LNG plant and now the 50% ownership of Braemar 2 power station. Copyright 1973-2011. Scandinavian Oil-Gas Online. ISSN 1500-709X.